I really enjoyed this book. I am actually a little surprised by how much I ended up liking it. I decided to read this book because I was intrigued by the description. It was that same description that had me worried that this book may not work for me. I love the idea of unreliable narrators but I have had mixed luck with them. Let me just say that this book worked very well for me on all levels. I read almost the whole book in a single day and could seem to stop turning pages. I am so glad that I decided to give this book a try. This is Amber's story. Amber is in a coma and can hear what is going on around her but can't respond. I was immediately drawn into the story because I felt like I needed to know how Amber ended up in that coma. I wouldn't really say that I liked Amber or any of the other characters in the story but I didn't dislike them either. I had no idea who to trust at any point in the story. The dual timelines in this book worked well. Piece by piece, we learn the details of what events led up to her hospitalization as well as everything happening around her while she is in the coma. I was really equally interesting in both timelines and thought that the story switched from then to now at just the right moments to keep the story moving forward. This book was full of twists and turns. It is really best to go into this book as blindly as possible which I was thankfully able to do. As I read the book I quickly discovered that everything that I thought I knew about the story was completely wrong. I was taken by surprise many times over the course of the story and sometimes had to take a short break just to process what I had just learned. I quickly began to expect the unexpected and I still found that I was shocked by some of the twists along the way. I would recommend this book to others. I loved how this book kept me guessing until the very end. 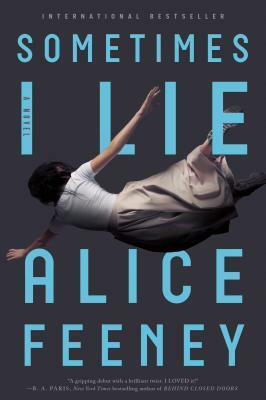 I am really impressed with Alice Feeney's style of writing and hope to read more of her work in the future. I received an advance reader edition of this book from Flatiron Press via NetGalley. ALICE FEENEY is a writer and journalist. She has spent 15 years with BBC News where she worked as a Reporter, News Editor, Arts and Entertainment Producer and One O'Clock News Producer. Alice is a recent graduate of the Faber Academy Writing a Novel course. Alice has lived in London and Sydney and has now settled in the Surrey countryside, where she lives with her husband and dog. I'm glad you enjoyed the book! It really is a great read. This was such a good surprise, Silvia! Oh it looks great there and I love to be surprised. I want to try now too! I think you would like this one, Melliane! I've heard some good things about this one but I have to admit that it actually scares me. Over hyped thrillers have been so hit and miss for me. I haven't liked all of the thrillers with a lot of hype around them but this one really did work for me. I do wonder what is right then...interesting! This one keeps the reader guessing. This seems to have a lot of things I like in books - unreliable narrator, dual timeline, twists and turns. Glad you liked it and not I have to check it out. Great review! I hope you enjoy this one if you get the chance to read it, Grace! Yay! I am so glad you enjoyed this one. Wasn’t it craz! I love being wrong about what I think is going on. Makes for a great thriller. I love it when I am wrong as well and I was wrong a lot with this book. Love the sound of this one! I love amnesia/ coma type stories where everything is up in the air, and the more twists and turns the better! Sounds like this one delivers! I do like an unreliable narrator at times... and it would be so freaky to be in a coma but able to hear people around you. Yikes!! I am curious about this one. I love stories that keeps me guessing and from the looks of it this is one such story. Thanks for sharing. This one would most likely keeping you guessing the whole time. I have seen this book before. I love unreliable narrators if executed well, and it sounds like that is the case here! Which has me eager to read this one. I'm always a bit dubious when it comes to dual timelines but more often than not it does work quite well. This one was really well done. So many twists and turns and the dual timelines worked well.